Is your puppy whining too much? Does she constantly whimper to get your attention? Here's why your puppy whines and what you can do about it. 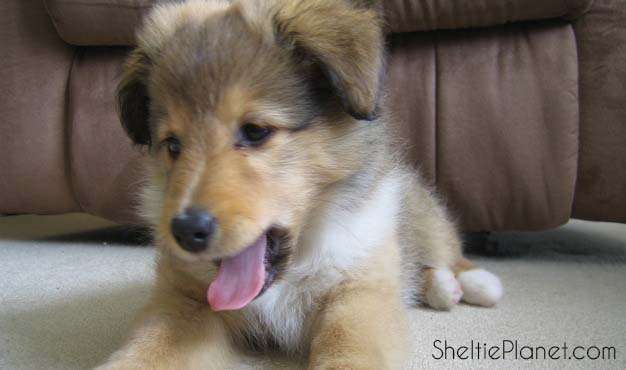 Why do Shelties whine? Read on for advice about your dog's whining and how to treat her physical or emotional discomfort. As puppies, whining comes naturally. Think of a baby crying. Puppies whine to get attention when they are hungry, tired, or cold. Their mom will react by providing them with milk, warmth and a safe place to sleep. But as time goes by, the growing puppy makes an association between the two. When they whine, they get attention. (Think of the toddler who whines even though they have developed more sophisticated ways to get their needs met.) This is known as Pavlovian conditioning and we actually use it to our advantage in clicker training dogs of all ages. 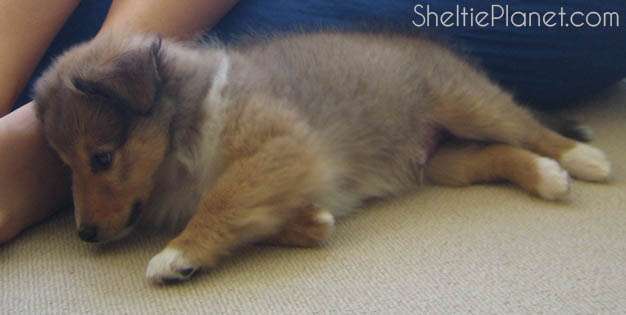 The ideal age to adopt a Sheltie puppy is at 8-10 weeks old. This is the time that your puppy will either learn that whining doesn't work with her new family - or that it does. If it does, she'll learn to use whining as a manipulative tool to motivate her new mommy to get what she needs. This can become a really bad habit her whole life, making you a slave to your pooch. Fortunately, with puppies, you can nip whining in the bud. Don't expect to get a blissful night's sleep the first night you bring your new puppy home. For her, it's a major lifestyle change - she's away from her mom and the rest of her litter for the first time ever. Everything is new and unfamiliar and she'll be looking for considerable reassurance from you. Your Sheltie will whine! The first night we brought Howard home at 8 weeks old, we encouraged him to sleep in a little box lined with pillows, right next to our bed. But not even this close proximity would stop this little puppy whining. It was like that scene in Lady and The Tramp where the puppy is so persistent and the humans so tired, there is only one inevitable outcome! And so the only way Howard would lay quietly was if we allowed him to curl up with us on the bed. It's such a common mistake, it's a cliche. If you allow your new puppy on the bed like this, you better get used to it. For Shelties, perhaps this isn't a huge deal. We're looking at a relatively small dog breed. But if you have a larger breed of puppy that's going to get BIG - or just any qualms about sleeping with a dog on your bed - you're going to need a different solution. In order to prevent this bad habit forming, dog experts generally recommend leaving your new Sheltie puppy alone on her first night. If you respond to her whining with positive attention (cooing, patting, sympathy, taking her out of the crate and cuddling her) she will become conditioned from day one. Brace yourself - it's got to be a tough love approach. But I Can't Just Ignore My Puppy Whining! But what if you don't want her on the bed AND you can't bear hearing her whine? What can you do? You'll need to use your good judgment. Don't feel like you have to cold-bloodedly ignore your puppy whining. A really nervous puppy does need some attention to distract her from her scary new surroundings. The trick is to respond in a timely manner so that she doesn't feel like it's her whining that's got the result. If you get the chance, wait until she stops whining, then initiate the contact. Pick her up and cuddle her and make her feel safe and comforted. This will fulfill her need for attention without conditioning her to whine. Having said that, it's not always realistic to wait until she stops whining altogether. Some puppies simply do not stop whining and will do it for hours on end. If you suspect this the case, you don't have to prolong your puppy's misery. Just wait until she's stopped whining for even a few seconds, then seize your moment. It's not ideal, but under the circumstances, it's the best you can do for her. Why do Adult Dogs Whine? 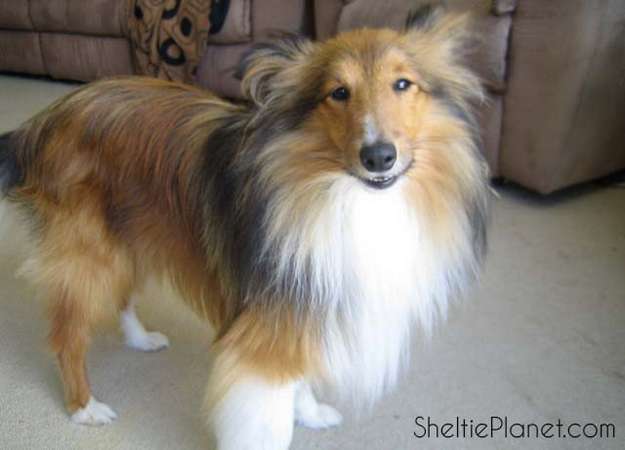 Got a whimpering adult Sheltie? Whining is not a natural form of communication between humans and dogs. Most dogs are able to drop this behavior by about six months. So if your dog is whining after this period, it means she's either doing it unconsciously, or she's learned that it's a useful motivational tool to get her needs met. Could she be in pain? Is she simply bored or lonely? Is she afraid or anxious? Does she need to go outside? Your response to her whining really depends on the cause of it. Sometimes whining is justified and does require a response. But other times, it's just plain manipulative and should be ignored if you want to break the habit. The following tips will help you identify the cause - and the right solution. 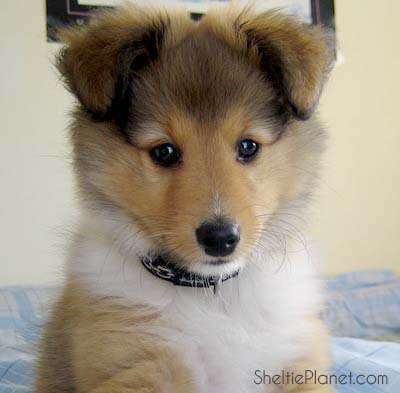 If your Sheltie starts whining suddenly and then keeps it up steadily afterwards, she may be whining out of pain. This isn't just limited to older dogs: puppies and young dogs can be subjected to some pretty severe growing pains, so don't rule out this possibility on the basis of age. If you think your dog may be in pain, check her over for obvious signs: is she holding any paws off the ground, or favoring one side of her body? Check her face and body for scratches and splinters. Next, you can palpate her limbs and joints for inflammation (like arthritis) and possible injuries. Be gentle. Run your hand down her tail to check for lumps and bumps, too. If you think your Sheltie's whining out of pain but can't find any injury, take a trip to the vet so they can identify and treat it before it gets worse. If your Sheltie is simply bored, you'll be able to tell because she'll wander around the house (probably following you around, or pacing about the room you're in) and whine aimlessly and without direction (like she's whining to herself). The best cure for a dog that's whining out of boredom is exercise: take her out for a brisk walk as soon as you can. In general, try to ramp up her daily exercise and dedicate more time to fun and games. A tired dog is almost never a bored dog. For a Sheltie that's whining out of loneliness, you'll have to try your best to spend more quality time interacting with her. If you don't have a lot of spare time, make the time that you do spend together really count: play, groom, train and cuddle. Normally, it's fairly easy to tell when your Sheltie is whining out of fear. Look for a direct cause to her fear. Fireworks, thunderstorms, strangers in the house or unexplained loud noises could be spooking her (even when you know she is perfectly safe). If she's an anxious dog, she might be whining simply because you're acting stressed out. Or perhaps there's been a change to her daily routine. Don't attempt to punish or correct her for whining out of fear or anxiety. That will only increase her stress and making the whining worse. Instead, try to ignore the whining. It's hard to do at first (in fact, it can feel like the least natural reaction in the world). But it really is the best thing to undo her conditioning. If you lend credence to your dog's whining by patting, sympathizing and cooing, she won't actually be comforted by it. Instead, she'll be more worried, because in a dog's mind you're validating the fear. ("Good girl, keep whining, that's right.") So don't pander to her but instead, distract her with play, or run through an obedience routine. If your Sheltie's whining because she needs to go outside, give yourself - and her - a pat on the back! This is the sign of a well-trained dog. She needs to go badly enough to be whining about it, and she knows not to do it inside. In whining, she's smart enough to try and let you know about it by grabbing your attention. This one's an easy fix. If she's standing near the door, or just has that look on her face, praise her and let her out.